Got an idea for a design? See something you want in different colors? and I'll see what I can do with your ideas. 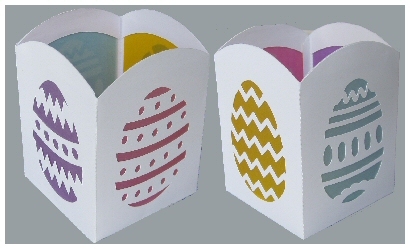 Some of the paper craft kits from the cruise are now available in my DIY Etsy Shop, along with some new designs based on those we did on the cruise. If you want any kit that is not in the Etsy Shop now, please and I'll add it. By the way, if you want a finished product rather than a kit, please let me know and I'll make it for you (for a fee, usually $10-$20). 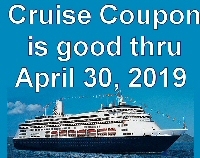 The Coupon Code given out during the cruise is good through the end of April (because it's taking me so long to get this all together - Murphey's Law, you know - everything will take longer than expected). Some of the jewelry kits for the craft projects from the recent Incan Empires Cruise are now in the DIY Etsy shop, along with other similar kits. More are on the way. The Coupon Code provided in class can be used on all kits in the shop, not just those from the cruise. One advantage to ordering through the web site is you get more choices. E.g., you can choose gold tone or silver tone findings (clasps, ear ring styles, neck chains, jump rings - all the "hardware"), and you can choose between earring hooks or posts. 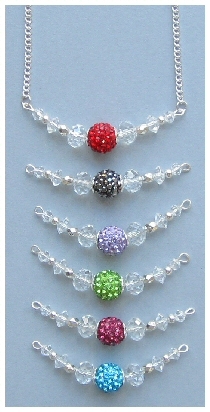 You also have a bigger assortment of colors to choose from. Some of the kits have been modified. E.g., the clamp and clasp on the suede barcelets is now a magnetic cord-end clasp easier to assemble than the clamp and clasp. It is the modified versions that are sold in the Etsy shop. Please read my copyright notice in the left column and help protect my rights. If you have ideas for modifications to designs or new kits, please email me. Click here for instructions for the Suede Bracelets. 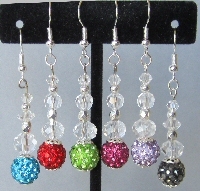 Click here for instructions for the Bling Earrings. Note that I found a new Bling Bead color - black (on the far right) which will be available in my DIY Etsy shop when the others are. The instructions are in .pdf files which requires Adobe (free download from the internet). Click here for instructions for the Vellum Flower Earrings. Kits were distributed on the recent Incan Empires Cruise. The instructions are in a .pdf file which requires Adobe (free download from the internet). When I was 8 years old, I learned to crochet - a potholder out of yarn first, then a doily out of thread. I was mesmerized by the idea of creating something beautiful. And thus began my creative journey. Since then I have tried many crafts. Some were fads whose popularity (and availability of supplies) came and went. Many are traditional crafts and variations on them. All are self-taught. Among my favorites: crochet; counted cross-stitch; Christmas ornaments and decorations; and quilling, the most artistically satisfying of them all. Quilling (paper filigree) is the art of rolling and shaping narrow strips of paper, and arranging them into designs. It dates back to 15th century Italy, in the monasteries where books were made (hand-written and -bound). In trimming the pages, nuns and monks used the "waste" strips to make coils and spirals into attractive designs, then decorated religious relics with them. As with other art forms during the Renaissance, quilling spread throughout much of Europe and became a pastime of upper class ladies, who extended the decorating of objects to include boxes, baskets, cabinets and screens. 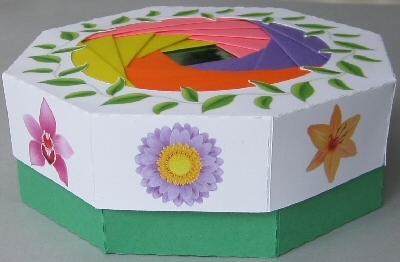 With the invention of the paper-making machine in England in the early 19th century and the resulting wider availability of paper, quilling became a leisure time activity for women in Europe and America; they still hand-cut the paper into strips and sometimes used bird quills to roll the papers. Its popularity declined around the turn of that century, but with improved tools, papers, colors, and precision paper-cutting machines, quilling was revived as a hobby in the mid 20th century and continues to have it's enthusiasts today in the 21st century. Website by BCDEnterprises ©2011-2019. All rights reserved.